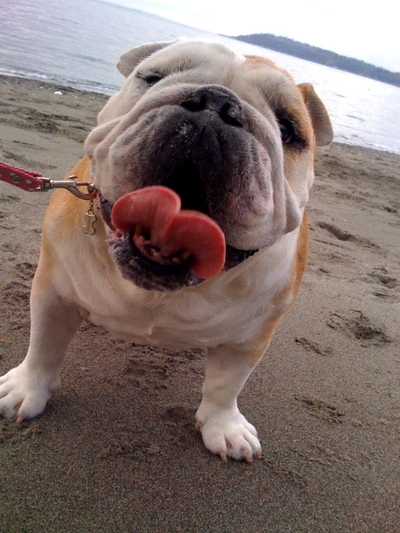 Enjoying another week of being Queen of the World, here's Tater Tot's latest day at the beach. 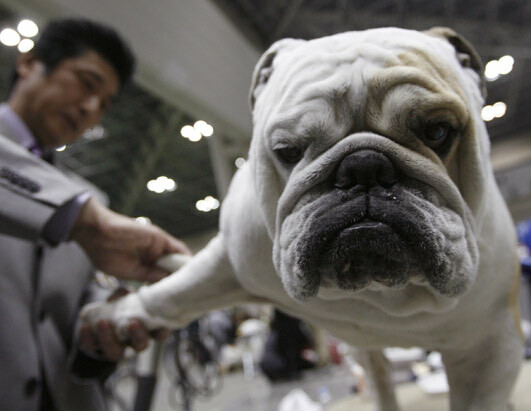 Thanks to blog reader John for sending me a link to the recent Asian International Dog Show. I don't have any information on this beauty but she seems to be getting her nails done for the competition here. Please enjoy your weekend, y'all! Tater Tot Fridays are better now than when I was in middle school! Have a groovy weekend. Love and Rockets, Tater Tot!!! tater makes my fridays tater-iffic! YAWN @ these Friday pics. Same dog, same expression, same, same, same!!! We've seen this dog before, over and over. Your little girlie-fanatics are the only ones who get all giggley over them. i know a lot of english bulldogs are named either winston or churchill. but that last photo of the girl really does look like winston churchill. The bottom dog looks like Hulk Hogan. tater has THE sweetest smile ever! have a good weekend bean, donna and your menagerie of fabulous babies!! !